Looks Neat. I once walked around town with it taking pics - it gets tons of looks and comments, especially from teenagers! Polaroid Film is no longer made, so you have to rely Fuji Film. 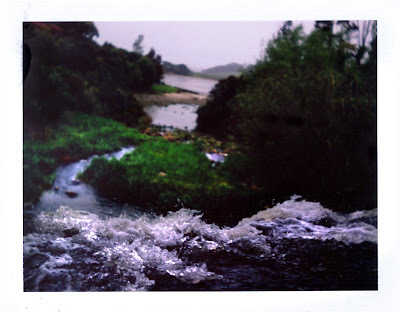 Polaroid film colours are not as saturate or vibrant as fuji, but has more subdued 'retro look'. Shooting close ups is difficult. Get a tape meaure and meaure it exactly for close shots - 3.5 ft minimum, or 1.07 Meters (107 cm). Very fiddly to pull film out. The piece of paper that you pull to get the film out has broken off more than once. you can slightly open the back to pull the film without exposing the film. Do I recommend it? Probably not. There are definitely better working cameras than this one, but you can get very good results from the camera. All my peel apart films posted here are from this camera, so you can get results from it (eg FP 100c Silk and Glossy, 669, UV ID, 125i, 669). In New Zealand, pack film cameras are hard to find for good price. Vintage camera stores have outrageous markups here so its best to look locallyon trademe or internationally on ebay for these types of cameras. I'll probably replace it with another pack film camera in the future. can you use fuji film in replacement of polaroid 600? So, where would you say the line is drawn with expired packfilm, black&white and color? I just recently got a hold of some color from '78.. and I'm afraid there's not much chance for me. So, what would you say "too expired" is? Ha. Wow, a '78 vintage? Don't think that will work - i had 779 integral from '99 that worked (10 years), thats the oldest film I've had success with it. I had some pack film from '98 but the chemicals were completely dried up and the film didn't work. However, just out of sheer curiosity's sake, I would still give it go!